The Video Game Bundle 2.0 includes 9 pieces of literature exploring the history and culture of videogames. Videogames have been around for some time now and while some are content to waste their time simply reporting on the popular story of the hour (poor fools), there have been an increasing number of writers opting to opine on videogames on a broader scale. In turn, there are now books aplenty exploring the history, culture and trends of gaming and the industry that fosters it. That being the case, it can sometimes be hard to figure out exactly which works to pay attention to. Luckily, the folks at Story Bundle have offered an avenue that should make the decision a bit easier. The site, which bundles together written works and sells them at a heavy discount, recently launched its Video Game Bundle 2.0. The bundle, which will be on sale until December 11th, contains a total of nine different works of fiction and non-fiction centered on the subject of videogames. While a few are magazine length, most of the included content are full-fledged books. 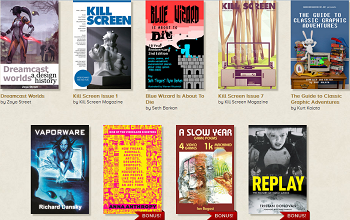 The full list of literature in the bundle includes: Dreamcast Worlds, Kill Screen Issues 1 & 7, Blue Wizard is About to Die, The Guide to Classic Graphic Adventures, Vaporware, Rise of the Videogame Zinesters, A Slow Year and Replay: The History of Videogames. Buyers purchasing the books will need to pay at least $10 to get their hands on all of them. If you're not interested in Rise of the Videogames Zinesters, A Slow Year and Replay, however, you can pay a minimum of $3 for a version of the bundle that excludes them. Customers are, of course, allowed to pay what ever they want above that minimum. For more information about the books, the bundle and Story Bundle itself, we recommend you drop into its official website. You'll have to stop in to buy the books any ways, so why not give it a look-see?